You can start and build a home-based travel business. Utilization of our training material, your computer, and a telephone provides your connection to a travel reservation system, without a major investment. You can offer the same services as any full service agency. 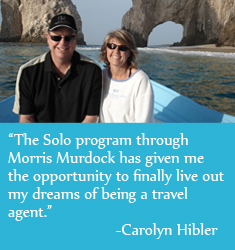 Solo is not a franchise, but an opportunity that allows you to have your own travel business with the support and buying power of a major travel company behind you. There is a one time startup fee and a month to month contract. The startup fee is required to be paid at the same time that the contract is signed. Tools and direction will be available to help you create your business of managing individuals, groups, organizations or businesses. You will build strong relationships by offering your clients competitive pricing and outstanding customer service. Our 1-800 Solo help desk number is available for your support. 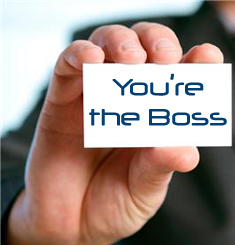 The accounting and administrative functions are done for you. You will receive updated product and travel industry information on a regular basis through the email system. You are granted the use of the Morris Murdock Travel ARC/IATAN/CLIA appointments. 1. Meet your client and determine the travel needs. 2. Research the travel products and options available. 3. Complete the booking process and finalize the transaction with the vendor. 4. Transmit the information to the Solo Help Desk for ticketing or invoicing. As a Solo Independent Travel Consultant working out of your home or office, you control your overhead costs and expenses, enjoy the freedom to own and operate a travel business opportunity and have complete independence. Choose from options to match your customers’ interests. You won’t have to produce monthly sales reports, wear a uniform or put a lot of up-front money for membership fees. You can sell to anyone, anywhere in the world. Solo does not restrict your market area. A ready made market may already be available. Your circle of friends, neighbors, acquaintances and family will want you to take care of their travel needs. Income is obtained from the fees you charge and the commissions paid by travel providers such as airlines, hotels, car rental agencies, cruise lines, and tour companies with a full range of quality travel products. Concentration on general travel arrangements allows for specialized opportunities in a travel niche such as: leisure and vacation, incentive or groups for schools, churches, sports enthusiasts, clubs, corporate business, etc. Excellent commissions and amenities from arranging group travel offer rewarding possibilities. Gather a group of friends, family, associates, and individuals with a specific interest in traveling together. Each month, you will be able to view a statement of all of the commissions that have come in. 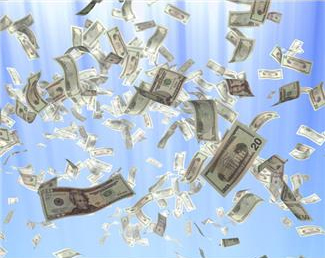 The commissions are directly deposited into your bank account each month.